to BENIMUR....I have a QSC K12 powered speaker which fell from the tripod (approximately 4 foot fall). Now the amps powers on but no sound. I tested both speakers separately with an external amp and they are both fine. I noticed the that L1 & L2 leads broke off on the main board. I temporarily connected the L1 & L2 and now I get the 12 inch woofer working but the high frequency driver still doesn't work. Need help to figure out which component is the culprit on the high frequency side. And I need to know which parts to order for L1 & L2 and I don't have the service manual so I don't know the values of L1 & L2. I'm Gina, and I’m a moderator for this topic. I sent your requested professional, Benimur, a message to follow up with you here, when they are back online. Experience: Have been in the business 25+ yrs., down to component level. Initially, the only readily available (at my end) technical documentation for this model is an exploded parts diagram with parts list. Unfortunately, the schematics for the amp board is not included. Could you perhaps attach/post a picture of the board particularly the L1 & L2? Ok give me a few minutes. It appears that L1 and L2 are merely inductors normally placed in series with the outputs before the speaker connections. These may be tested with an ohmmeter and should read 0Ω. Have you compared the readings of Q2, Q3, Q4 and Q5? Set the meter to LoΩ. Place the black probe (COM) to the solder terminal marked - between Q2 and D33, this would be the common ground. Use the red probe (VΩ) to test continuity/resistance. Test the connected speakers. 1 speaker terminal should read 0Ω while the other should be something like 4 ~ 8Ω. Trace these wirings back to the board. Repeat the test on the connection point. From there move to L1 and L2; before and after. All readings should be nearly the same as when the speaker terminals were tested. Actually, there may even be a clicking sound audible from the speakers when the terminal that reads something like 4 ~ 8Ω is tested. Could you please provide pictures of the speaker and its wires if possible? What am I testing here. I see where to put the black probe but not the red. So I should the speakers to the amp and power up and measure from the board? Please note that always, resistances are measured with the unit powered off and unplugged. The above would establish a baseline of the speakers coil resistance. Please note on which pins of the connector are the colored wires. Then plug in the connector to the board. Touch the black probe to the common ground. Also note that the earlier proposed common ground is also available on the screw holes with solder pads. • green and yellow are connected now to the board through the connector. Incidentally, was there a clicking sound when the speakers where directly tested? So I connect the speaker harness to the power board. Do power on the amp to test resistance of the speakers from the power board? Yes, connect the speaker plug/harness back to the board but and as posted earlier Johnny, "...Please note that always, resistances are measured with the unit powered off and (power) unplugged..."
Is reading this with the black probe to board common ground? Or readings between the 2 wires of each pair? I was connecting both probes to each speaker cable not the common ground. Please re-try with the black probe to the board's common ground and then red probe 1 at a time to each of the speaker cable. The objective is to establish if the yellow/black and green/black are tied to the board's common ground. • for the woofer, green/black is to common ground. As inquired earlier, is there a clicking sound audible from the speaker(s) when conducting tests? • 1 at a time ends of R159, R170 and R171. So we are stilling doing ohm testing? Also can I disconnect the speaker harness before I do the above test? When testing L1 & L2, and the resistors the speaker harness/plug should still be connected. All others with the 4 Qs can be done with the speaker harness/plug disconnected. Copy that. And the ends of the Ls please when able? Both ends of L1 should show nearly identical readings and the same for L2. Could you de-solder L1 and L2 and test out of circuit for continuity? I removed L1 & L2 from the baord at get .1 Ohms for both. If I wanted to replace these 2 inductors for new ones which part would I replace them with. I can't find the parts list for the amp. The 4 Qs start out in the .400M Ohms are start rising. Is this correct or am I measuring it wrong? So just to recap the amp powers up and sub woofer works but the tweeter doesn't. I connected the tweeter to an external amp and it plays fine. It would appear that L1 & L2 are OK and the readings is as expected (.1 Ohms for both). However, that the measurements earlier of "...L2 6.5ohms and .287m...L1 300ohms and .295mohms..." would indicate that the solder and/or copper trace of the board where the L1 & L2 are inserted/soldered may be the suspect. Please re-try soldering back in L1 & L2 and re-check resistance/continuity. Still, if for some reason L1 & L2 needs to be replaced, then the closest subsitute would be filter coils from an SMPS (switch mode power supply) such as that of a desktop computer. As long as none of the Q legs read 0Ω to ground is good. I understand that the only issue is no tweeter and I am inclined to suspect a board connection; i.e. a cold solder or a cracked board. Based on this, follow/trace where the yellow/black wire to plug to connector to board went. If I need to change L1 & L2 are there any certain values I need to replace them with? For example amp & inductance ratings? Can you suggest a part # XXXXX digikey or mouser? What does L1&L2 do? Is it used for both drivers? I will trace the yellow/black wire later tonight and report back. Does the woofer work with only L1 de-soldered? How about if only L2? And what if both are de-soldered? Almost always, the output of an amplifier circuit has a parallel resistor / inductor inserted between the output transistor pair and the real speaker load. The purpose among others is to stabilize the impedance presented by the speaker that really varies due to frequency responce of the moving voice coil and isolate the amplifier from speaker oscillations. Perhaps the discussion HERE may shed additional insight while HERE on how to make your own. In the same token, inductors together with capacitors are used in a passive crossover / dividing network. As its name implies, its function is to split off the amplifier's output into low and high and directing these to appropraite speakers; woofer and tweeter. Please click HERE for designs/samples of passive crossover/dividing network. Still, in some other designs, the inductors are used as part of the DC filtering; i.e. to improve hum/noise reduction. Woofer doesnt work when L1 & L2 is disconnected. If the inductor is acting as an crossover is it really necessary for test purposes for it to be connected. So the current goes through it? Yes, as the output audio signal passes through it in a crossover usage. We go back to the earlier test with L1 & L2 connected/soldered back into the board. Test for resistance to ground of both ends of L1. Do the same for L2. Since out-of-circuit it reads 0.1Ω, then both ends should test with the same reading to ground. 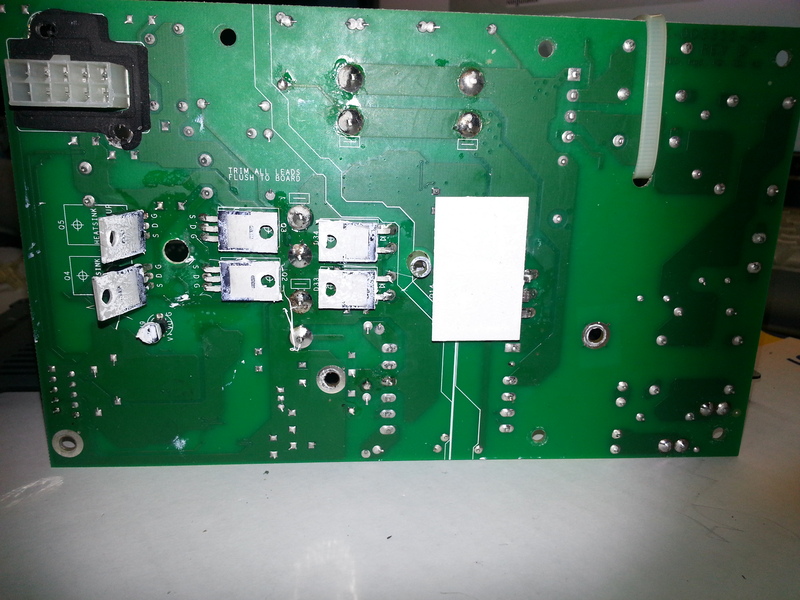 The objective is to determine if the solder joint / copper trace of the board are good. The suspicion has now shifted from L1/L2 to the solder joints / copper trace / board connections particularly where L1/L2 is soldered into. As also above posted, additional test would be to trace where the yellow/black wire to plug to connector to board went as the main issue is no tweeter. I resoldered L1&L2 and now they both read .1 ohms but I still only get sound out of the woofer. I looked for cracks and solder joint issue but can't find them. Which Q legs are for the woofer and tweeter? Johnny, anything on tracing the yellow/black wire? How do I tell where it goes? • repeat red probe procedure to all solder points connected to the pin of the yellow/black wire. do you mean from the back to the board where the q chips are? Both sides Johnny. Please note that the connector pins are soldered on the top side while the other components are soldered at the bottom side hence the likelihood that the yellow/black is tied to1 or more component of either/both sides. • and which is by the yellow wire? With the speaker harness/plug removed, what is the Ω reading of the connector pin for the yellow/black (with the black still at common ground)? It starts from 75.1k ohms and climbs. When doing this test do I put it in continuity mode and leave the black lead on the yellow/black connection and move the red lead until i get a constant beep? "...starts from 75.1k ohms and climbs..." seems to be very high...as if not connected to a component or if at all, most likely to a capacitor. Yes please, move the black probe over to this pin (where the yellow/black went to). Use the red probe and locate where in the board (both sides) it leads to (may be more than 1 solder point). It should read 0.1Ω or even 0.0Ω (constant beep). • if to a part, then that part and/or its other end would now be the focus of interest/suspect. I did this test on the amp board with the speaker harness disconnected. Im doing the trace test on the back of the board and some coneection just provide a single beep. What does this mean? Yes with the speaker/harness disconnected. If connected, the tweeter's own 6.02Ω resistance would "color" the actual board readings hence the requirement of unplugging. The single/short beep would indicate momentary connection, just like a capacitor charging/discharging. We need to find a solder point with a constant beep indicating a 0.0 or nearly Ω reading as this would be where the yellow/black is connected to. Appreciate your patience on this reverse engineering approach. Which is C4 please; the big red block closer to L1 or closer to the edge? C4 is closer to the edge of the board. The leads to the edge of the board constantly beep the ones one the other end only beep once. Now we know that the tweeter (yellow/black wire) is connected to the board through C4. Focus now on this C4 and where it leads to. Move the black probe over to the other end of C4 (opposite of the one at the edge) and trace with the red probe where it goes (constant beep) please. next point of constant beep is L1 lead. So what we are doing is bascially tracing the connection to the point where there is a break. If we had the schematic we would just look at that right? Yes, tracing back; reverse engineering since no available schematics. And again yes on looking for a break. I have a good number of schematics of QSC products/models but for some reason, none for the K series. so the yellow/black connection goes to c4 & r159 which are in parallel than to L1 and than to Q2 S lead. Can you explain the path from the connection to the q2 and what each component does? I'll try to come up with a rough schematics. Can you please try to carefully get the numbers off Qs2~5? I don't understand. Please elaborate. What are the part numbers of the Qs please. • while pins 1 & 4 would be the ± supplies. What would be the best way to confirm that the caps and resistors are working properly? What are next steps to resolve the tweeter not playing? Also they inductors has some sort of white paste glued to the bottom of them and the board? What is the paste? They are also using a gary paste connecting the top of the 2 inductors together? What paste is that? I touched one of the inductors when it was playing a felt a little tingle. How much voltage goes to the inductors? The resistors could be tested using the Ω function of the multimeter while the capacitor could be tested using the Capacitance Measurement capability of the meter. Both substances are some sort of glue to make the inductor fixed to the board in addition to the solder hold and to each other. These glue are electrically inert and primary function is physical restraint of the inductor and to make these 2 not to vibrate. What is the rating of the black capacitors nearer to the yellow transformer please? The voltage specs would give you an idea of the operating voltage of the amplifier. Another approach other than reverse engineering in resolving the tweeter issue is template comparison. Is there another QSC K12 but fully working available? There are two big ones. The biggest ones are 470uf 400wv the other one which is a little smaller is 110v1800uf. I dont have a working QSC k12. When I test the resistors and capacitors can I test them in circuit and get a good reading? Can you recommend a white glue for sticking the bottom of the inductors to the board and glue for the top to join both? The smaller ones are for the supply of the amp. The amp would most likely be running on around ±75V. The capacitor and resistor should be tested out-of-circuit or at the very least with 1 leg desoldered / lifted (if possible). If in circuit, the other components would affect the readings and provide false values. Consider using high temp Silicone Sealant to replace the "glue" top and bottom. When live testing with the woofer working but not the tweeter, have you tried carefully touching, gently pushing, wiggling any of the components just to check if doing so would cause the tweeter to work? It may be better to use a plastic rod or equivalent. I have tried to wiggle the through hole components while the speaker was on and being fed a signal but no luck. Please confirm that S of Q2 is connected to D of Q3. And after live testing (even with no sound yet from the tweeter), did all 4 Qs heated up equally? The continuity test of S of Q2 to D of Q3 is no longer needed if all 4 are equally heating up. Do you have acces to a spare non-polarized 5µF/50V capacitor? No sorry which one is that used for? I was hoping to test / bypass wire the tweeter through the non-polarized capacitor. Next would require out-of-circuit test of C4. OK so how should I test it? What value is good and what is bad? The Fluke 289 is able to measure and display the capacitance in µF. Compare the meter's reading with the specs printed on the actual capacitor (C4). The reading should be and the printed value should be nearly the same. Agree then that the capacitor is good and the tweeter should have been working. Please bear with me, what is the resistance of Q2's S leg to common ground? The resistance of q2's s leg starts at 66.6k ohms and climbs. Are q2 and q3 for the tweeter and q4 and q5 for the woofer? If so does one amplify the signal a little and the second some more? How much voltage does it amplify? Can't say without a schematics. I am inclined to think that this model is bi-amped; separate amp for tweeter / woofer hence each pair is an output and independent of each other. • L1 goes to Q2/S-Q3/D. - but if L1 is removed, the woofer does not work? L1 & L2 are back I soldered them back. 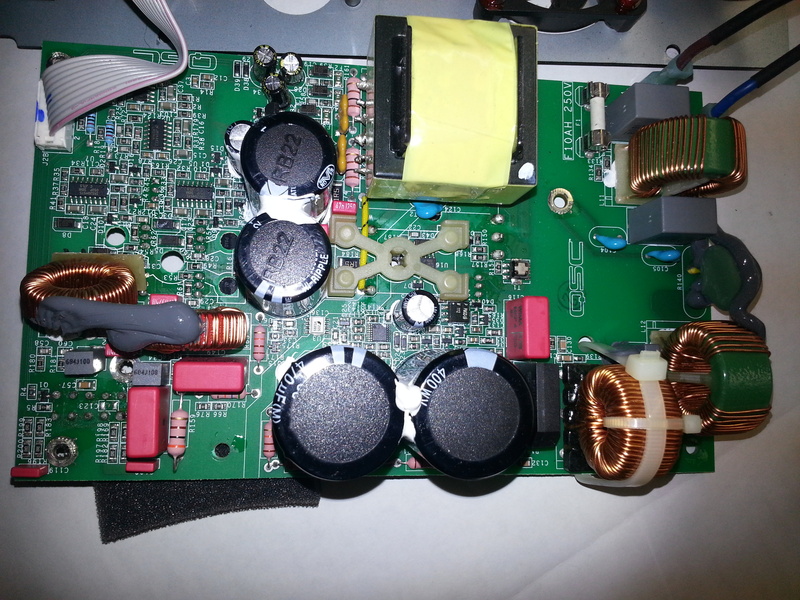 In 1 of the test requested "...Does the woofer work with only L1 de-soldered? How about if only L2? And what if both are de-soldered?... ", the reply was "...Woofer doesnt work when L1 & L2 is disconnected..."
L2 is for the woofer and L1 is for the tweeter. 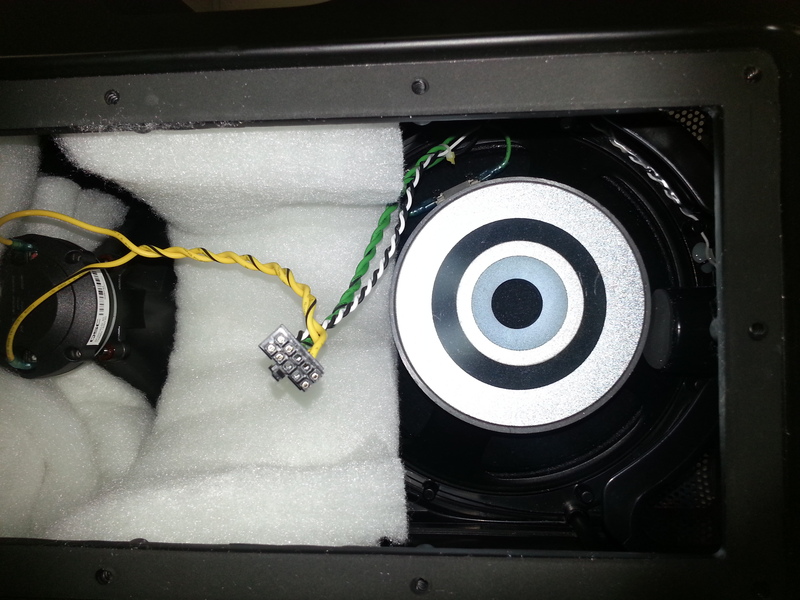 When I took out L2 the woofer didn;t work and when I put it back it worked. I had L2 and not L1 connected and the woofer worked. Should you consider, de-solder / remove Q2 & Q3 (to protect them). Turn on the K12 with a source feeding it and set to low volume. Momentarily jump L1 and L2. The idea is to power the tweeter with the same amp as that used by the woofer. The objective is to confrm that the feedline to the tweeter is functional. 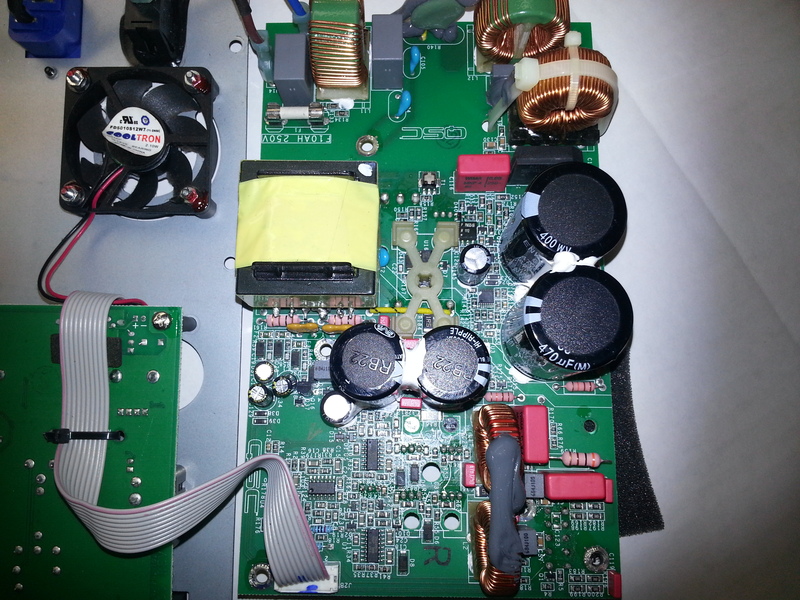 If the tweeter works, the suspicion would now shift from the capacitor, coil, connection/trace/break to amp circuitry. If I do that is there a possibility that I could cause more damage to the amp board? With Q2 & Q3 desoldered, the biggest risk has been removed. There is still a remote chance of further damage; but then again remote / small chance. Would you venture this approach? Have we exhausted all other avenues? Do you have to go to sleep? Your located in Manila right? At this point, yes; all passive tests have been done hence the proposed active test. A bit further down South. I'm in NY and its 4:17 in the afternoon. I apologize for keeping you up. Get some rest I'll check a few other things and we'll discuss later. Would look forward to an update late when able. My cousin took back the qsc k12 speaker and decided to buy a new amp module. Wish we could have gotten it working. The new module is $400. Appreciate the post back Johnny and I understand. Pity but rather challenging considering no schematics. Perhaps next time on another project. I have a couple of old MTX TP-112, 2-way cabinet speakers. ForCustomer Hey Louie I have a Yorkvillenx750P powered speaker.